I heard plenty of good things about Kim Boyce’s Good To The Grain yet I was hesitant to buy this cookbook on whole grain baking. Why? My last two experiences with recipes from the book left me disappointed due to one reason or another. The rave reviews came from bakers I trust yet I just couldn’t justify the purchase of a specialized topic cookbook unless I feel compel to keep baking from it. However, the premise of whole grain baking for its great taste (not just to feel righteous) is too enticing. Good thing I refuse to give up because third time’s the charm. Finally, I encounter a recipe that persuaded me to place my book order. These carrot muffins with streusel topping aptly plays the part of poster child for wholesome eating with an equally delicious taste. The recipe has been posted on Leite’s Culinaria for a while and I accidentally came across it in my search for more carrot recipes. You read that right, I am now on day 3 of Carrot Week (Just kidding. It’ll NOT be carrot week at Dessert By Candy, I promise. I’m down to the last three carrots). I love the tender texture of these muffins made with hard whole wheat flour and oats. Blending whole grain flour with all-purpose flour ensures the muffins do not get too heavy. Boyce’s version calls for spelt flour and oat bran but I was eager to experiment with the freshly grind whole wheat flour I got from my CSA last week. With spelt being a close cousin of the common wheat, this substitution ought to stay true to the original recipe. This muffin did away with all the typical add-ins that may distract from the pure taste of carrots. Instead, the sweetness of the vegetable is highlighted with a good amount of allspice. This departure from the more predictable renditions with cinnamon taking centre stage makes these muffins memorable. I also got to use those ginger-infused Demerara sugar in the pantry. The streusel topping got the whole grain treatment as well and it is a crowd pleaser. The nuttiness of whole wheat flour provides plenty of flavour without using a single piece of walnut. 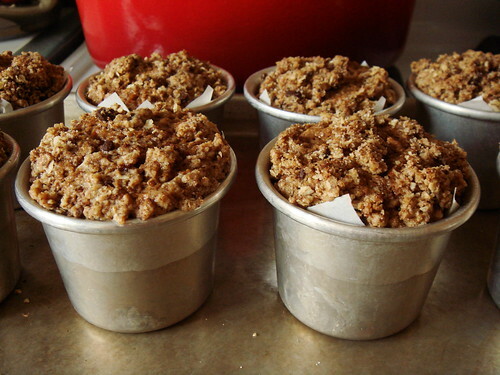 When I mound the streusel on top of the batter, I was afraid that most of them would end up on the baking tray. I worried too much. 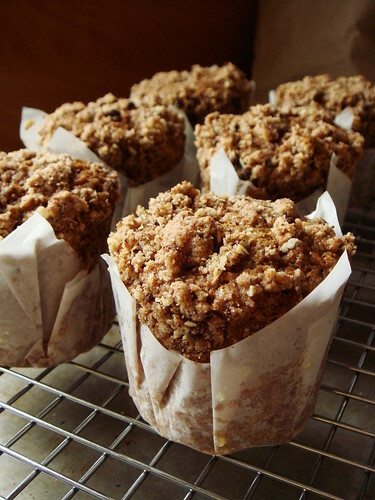 The yield of this recipe is amazingly accurate for 8 muffins with a handsome dome crusted with crunchy streusel. I really like the rustic look of muffin liners made with folded parchment paper. The instructions from Martha Stewart were intuitive enough yet I was not happy with the result. It was all too easy for the paper to sit lopsided or the folds not clutching to the side of the baking tin. And then I realized how stupid of me to try to fit the paper inside the indentation. I turned the baking tin upside down and centered the paper over the bottom of the muffin cup. A quick press with both hands and I ended up with neat pleats all the way around. The folded liners fit perfectly in every indentation once you turn the pan right side up again. This is a great look for more rustic muffins. For dainty cupcakes, I’ll stick with premade paper liners.